So, you're having trouble beating an enemy group? Luckily for you, you can take the strength of that enemy group, and turn it into your own strength by converting enemies! 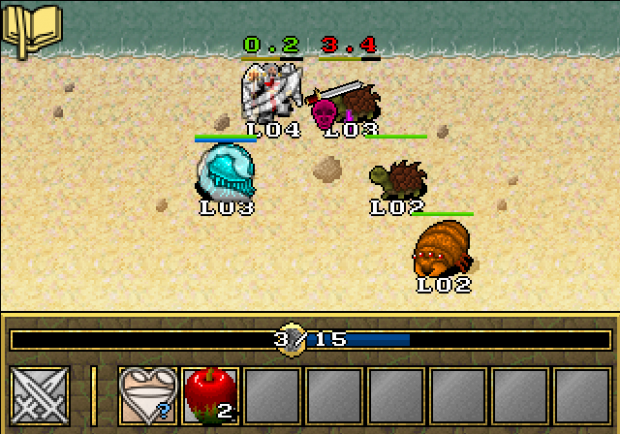 When you use the convert spell on an enemy, a white progress bar will fill below their health, and when it reaches 100%, they will run away from combat. After the battle is over they will appear in your list of followers. You can then drag them into your active followers list to use them in future battles - just make sure you put them in the right place! All followers have a different range of attacks, and if they are too far away from the front (the top of the active followers list), they will not be able to attack. You can figure out where to place allies by noticing where enemies are placed - the Jellyfish (while it was an enemy) was in position 2 and effectively poisoning my angel with a range 2 attack called Sting. 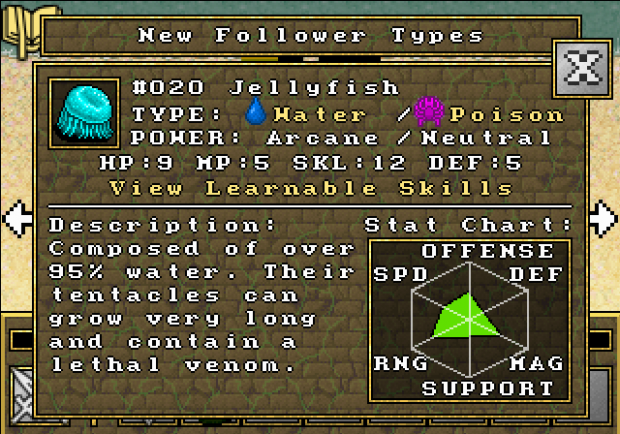 Placing the Jellyfish in position 2 in my group is smart - then it doesn't take hits from melee attacks, but can still poison enemies from behind. Take that turtle! 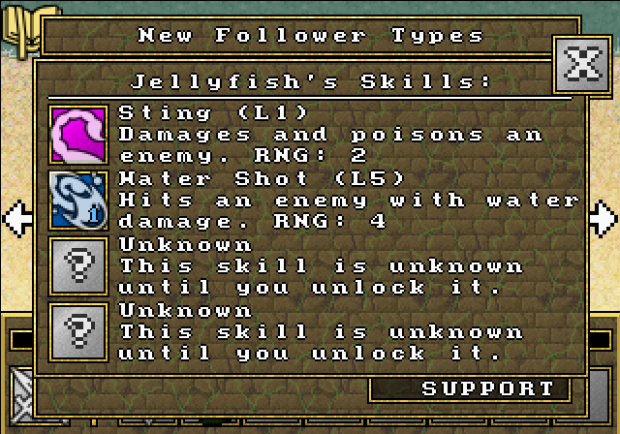 An effective party has all followers using skills at the same time. If a follower is doing nothing, then not only is it not helping out, it is also in danger of getting hurt from long range attacks. If a follower cannot attack, you may need to recharge their mana or reposition them so that they are in range. In the above image, both the Angel and Jellyfish are attacking the turtle at the same time, creating an effective team. When you convert a new follower type or view the follower type from the bestiary, you can see a breakdown of that type's stats and abilities. The stat chart gives a quick overview of all the stats - it shows that the Jellyfish is fairly well rounded. OFFENSE describes how many offensive type skills it has and how high its SKL stat is. DEF describes how many defensive type skills it has and how high its DEF and HP stats are. MAG describes how many mana using skills it has and how high its MP stat is. SUPPORT describes how many support type skills it has. RNG describes the range at which it can attack - this may change as it learns new skills, but it gives you an idea of whether the follower should be at the front or back of the list. SPD describes how fast it attacks (based on the cooldown of the skills it has). This view also tells me that the Jellyfish has two types - Water and Poison. This means that it has the strengths and weaknesses of both Water and Poison types. Knowing types will help you predict how your followers will fare in battle. 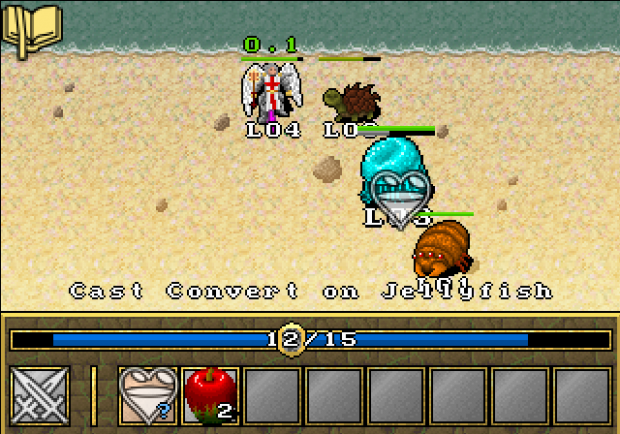 For example, Plant-type followers deal 2x damage to Water and Poison types, and so would deal 4x damage to my Jellyfish! You can click either type to view the full type table showing which types are weak/strong against which other types. If you click "View Learnable Skills," it will show you what skills the Jellyfish will learn, and what levels it will learn them at. My level 3 Jellyfish only knows Sting, so it can only attack from position 2. But, when it reaches level 5, it will learn Water Shot, which has a range of 4 (hence the high RNG stat in the stat chart above). Water Shot may have higher damage and range than Sting, but it costs 1 mp each time it's cast, and it deals water damage instead of poison damage - which could be better or worse depending on the enemy type. Equipment skills like Strike and Shoot use the melee and ranged weapons equipped to the follower, so their range, speed and damage all depend on the weapon equipped. Sometimes, choosing a weaker weapon to increase the follower's range will help balance your team. When using skills that cost mana, you need to know what kind of power the follower uses, which is shown in the type info window. For the Jellyfish, the power is Arcane/Neutral. Arcane means that it uses it's own private mana source, and only arcane followers have MP. If an arcane follower runs out of mana, you have to recharge them with an item or spell, or they will no longer be able to cast spells. The power type can also be Martial, which means that the follower can use any skills (even ones that would normally cost mana) for free. 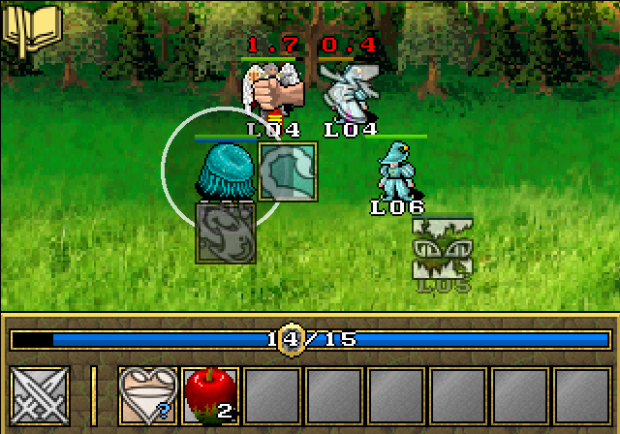 Lastly, Divine followers use your (deity) mana pool - specifically, any mana left of the slider (see the battle images). If the mana to the left of the slider runs out like in the second battle image, then Divine followers will not be able to use any skills requiring mana until you recharge your mana or move the slider. While Divine followers are more powerful than others and have access to a larger mana pool, they will use up your precious mana stores, which in extended battles (or locations) can end up being a problem. The alignment of the follower (Good, Neutral or Evil) is mainly used to determine how difficult the follower is to convert, and it is always easier to convert followers of the same alignment. Once the follower is converted, typically there is no other penalty for using that follower, even if it does not have your alignment. However, if you are a Good deity and the follower is Evil (or vice versa), then the follower will require more experience to level up, and it will also require 1 extra mp every time it tries to draw mana from your mana pool for spells (if it is a Divine follower). While you now hopefully have an effective and powerful group of followers, you may notice that you or your followers quickly run out of mana, and you have to either leave the area or use items to continue. Rationing items can help, but with the right support units, you can have followers recharge each other and keep them self-sufficient longer. The recharge skill costs three mana but charges four mana, so followers that have this skill can even recharge themselves as long as they have over 3 mana! You can also enable/disable skills by clicking them in the "View Skills" menu, or click and hold the follower to bring up the skill ring, which allows you to select and enable a single skill and disable all others. This allows you to disable mana-costing skills until you need them (for more difficult battles), saving your followers MP. For example, my Jellyfish in the above image reached level 5 and learned Water Shot, but since this battle was easy, I disabled Water Shot to conserve its mana. You can also speed up or slow down the battles at any time by going to options, and changing the Speed slider towards S (slow) or F (fast). This only affects the battle speed - and allows you to blow through battles quickly, or see every move and have time to react/cast spells. Another useful feature is the hotbar at the bottom of battles. While you can drag items and spells from the menus to use them, you can also drag them down to the hotbar once, and then use them from the hotbar quickly as many times as you wish. Having two powerful groups of followers is also very useful (instead of always using and leveling the same group). 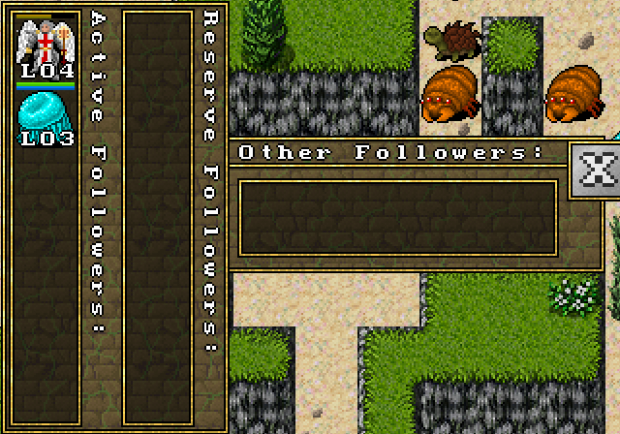 That allows you to swap out followers when they get low on HP or MP, letting you continue fighting longer and perhaps even find some fountains to heal your followers. You can also keep reserve melee followers in the back of your active party, where they are unlikely to be hurt. While they can't attack, when your tank starts to get low on HP, you can enable the reserve's charge skill (if it has it) or use an “advance” spell to move it to the front. Figuring out different combinations and uses of skills, and enabling/disabling them to use them at the right time allows you to get a lot more power out of your followers and will allow you to win battles much more effectively than you would have otherwise.